When Da’Rick Rogers joined the Colts on September 2, his first quarterback wasn’t the guy whose jersey will be found on hundreds of people Sunday inside Lucas Oil Stadium. Instead, Rogers was catching balls from a player with 15 years of NFL experience and 152 starts at the quarterback position. Rogers loves talking about his “first quarterback here” and the guidance that Hasselbeck provided the rookie. “Hasselbeck is a good guy. He’s a veteran in the league and he just really, really helped me on being a professional,” Rogers says. Hasselbeck points to one key area where Rogers has particularly developed over the past three months. “Where have I seen him improve is I’ve seen him accept that coaching, understanding that he needs to get open within the concept of the play and what we are trying to do,” Hasselbeck says. It’s the reps that Rogers and LaVon Brazill received from the Colts veteran backup that are turning into concrete results on Sunday. Hasselbeck wants to be careful not to put too much pressure on the young receivers. He knows the playmaking ability is there and now it’s all about repetition. “Those two young guys, we just need them to be pros, know their job and do their job. When the ball comes their way, make a play. That’s it. 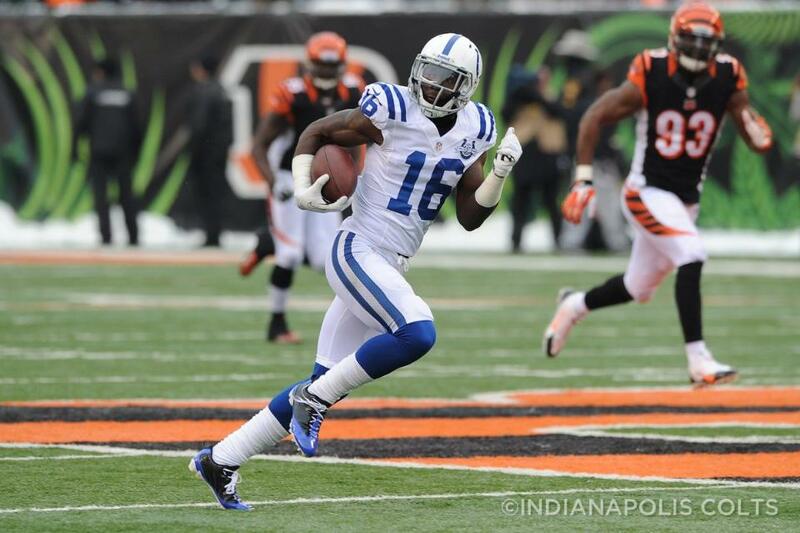 On Tuesday, it was once again the “Reggie Wayne Show” with Queary and Schultz. With the regular season back in action, the Chuck Pagano show returns hosted by ‘Voice of the Colts’ Bob Lamey on Monday nights. The Colts had a total of 60 offensive and 77 defensive snaps on Sunday afternoon. In his NFL debut on Sunday, Daniel Adongo logged 22 special teams snaps. Adongo even fielded a pooch kickoff and had 1 kick return for 0 yards. Adongo lined up in the front line of the kick return unit on the far right side of the field. On kickoff cover, Adongo was the first person lined up to the right of Pat McAfee. The wide receiver breakdown for a total of 60 offensive snaps are as followed: T.Y. Hilton (45), LaVon Brazill (42), Da’Rick Rogers (41) and Darrius Heyward-Bey (23). The rise in Rogers snaps continues the trend from what we saw late in the Titans game on Dec. 1. At the running back position Donald Brown (32 snaps), Trent Richardson (24 snaps) and Chris Rainey (3 snaps) accounted for the snaps. Brown had 8 touches for 29 yards. Richardson had 11 touches for 88 yards. At inside linebacker Kelvin Sheppard (51 snaps, 5 tackles) got the start. Pat Angerer played 22 snaps and finished with 1 tackle. Intro: Indianapolis won the AFC South title Sunday in a manner less-preferred than anyone wished. The Colts fell behind by 21 points early in the second half at Cincinnati and rallied to make it a one-score affair before eventually losing, 42-28. The Colts have three games left to hone their playoff approach. INDIANAPOLIS – The Colts’ 42-28 loss at Cincinnati was not made any more palatable when three hours later Tennessee lost at Denver to hand Indianapolis its eighth AFC South crown. The Colts fell behind by 14 points at halftime, a margin that grew to 21 points before the offense roared to life. Still, four touchdowns in the final 30 minutes could not rescue the day as Cincinnati grew its lead back to 21 before winning. The Colts are in the playoffs. Time remains to sharpen aspects of the approach in all three phases, and here are FIVE THINGS LEARNED. PLAYOFFS GUARANTEED – The Colts are one of three teams (Denver, Seattle) to nail down a playoff berth, the only one to claim a division crown at this point. That cannot be taken away, and it was the first goal the team had entering 2013. “A division championship is a division championship any way you get it,” said Jim Irsay. Said Robert Mathis, “I’m not going to sneeze at a division title. We just have to work from here.” Sure the team is not functioning at the level it seeks, but a ticket has been punched to play beyond 16 games. That is an accomplishment. Every other goal the team has still is in play. EXECUTION IS ELIXIR – A scoreless first half with no third-down conversions in six attempts had the Colts in a halftime hole. With five-of-40 third-down conversions in six games, it’s hard not to mention. The Colts have had a first-half lead in only one of the last six games and have been out-scored, 114-24. The combined deficit is 49-9 in the first quarter. During the span, Indianapolis has 15 two- or three-and-outs on 37 possessions, with 16 total possessions not producing a first down. Opponents have four three-and-outs in 34 possessions, with only five drives not yielding a first down. The first-half time of possession disparity in the six games is 101:16 for opponents and 78:44 for the Colts. HOPEFUL SPARK IS FOUND – Eight Colts receivers had first-half receptions at Cincinnati, but T.Y. Hilton was not among them. Hilton was targeted five times in 46 Andrew Luck passes, and he did not catch a pass until 12 minutes remained in the game. Da’Rick Rogers (six receptions, 107 yards) and LaVon Brazill (three-for-53) saw significant time, and each had two touchdown receptions. Granted the tilted scoreboard created a higher number of passes than planned, still a team looking for a spark among receivers may have found one at Cincinnati. Rogers is young and learning. Brazill needs to make a push as his second year nears completion. Yesterday’s production was a needed boost that needs to remain. Each showed a physical nature that produced yards after the catch. SERGIO BROWN IS SPECIAL – Sergio Brown has been among many bright spots for the Colts this year. Every unit likes a go-to performer, and Brown has been that on coverage units. With seven tackles, Brown is among club leaders. He also has two fumble recoveries and a blocked field goal. Twice against Denver, he downed punts deep in Broncos territory. At Cincinnati, he downed a punt at the one and batted another back into play that was downed at the Bengals’ four. Brown is a heads-up guy, a play waiting to happen. STINGIER ON GROUND – Seven times this year the Colts have allowed 140-plus yards in a game. Seven of the last nine opponents have rushed at least 30 times, each time topping 30 minutes possession time and but once not reaching a 4.0 average. Cincinnati ran 35 times Sunday, netting 155 yards and a 4.4 average. Where some games have had skewed rushing totals with quarterback scampers (Ryan Fitzpatrick had 54 of Tennessee’s 162 yards and eight of its 36 attempts a week ago), yesterday was not one of them. Five times in the last eight games an opponent had at least 33:55 possession time. Opponents’ rushing production is a factor in the time of possession, and it creates added pressure on the other team to maximize its opportunities. 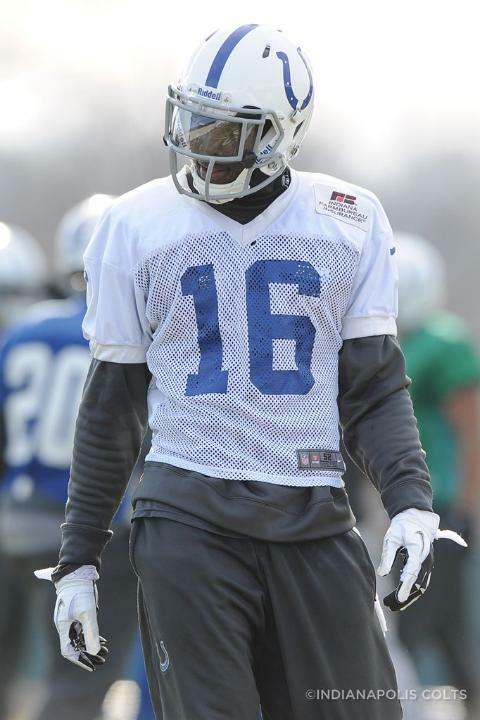 On Tuesday, it was once again the Reggie Wayne Show with Queary and Schultz. Over the past few weeks, Colts fans attention on the status of Da’Rick Rogers rivals that of any player on the team. Fans are clamoring to find out when the ultra talented Rogers will make his NFL debut. Could it be this weekend for the rookie wide receiver? “I would venture to say that’s a good probability,” Chuck Pagano said on Wednesday when asked if the four current receivers on the 53-man roster will be active this weekend. The enthrallment in Rogers stems from him leading the SEC with 67 receptions for 1,040 yards during his 2011 season at Tennessee. Off the field issues caused Rogers to go undrafted this past April but it appears he’s beginning to realize that the clock is ticking on his chances. Pagano talked about that acclimation period that players go through when making the move from a practice squad (where they are mostly scout team players during practice) to the 53-man roster (where they are actually running the Colts playbook at practice). Now, it’s extended reps with Andrew Luck and the Colts quarterback likes what he sees from the 6-3, 215-pound Rogers. “He’s been doing a great job, focused, done a great job learning the playbook so I’m excited for him and excited about him,” Luck said. And Pagano’s thoughts on Rogers? “Now he’s at a point where he’s picked things up and we are going to put him out there and give it a shot,” Pagano said of Rogers. Rogers knows the Colts are searching for some production from a receiver not named and T.Y. Hilton and the rookie is relishing the chance to make an impact. “Coach Pagano has put that pressure on us. “That pressure makes dominance so just go out there and do what you go to do,” Rogers said.